Cannot open the disk ‘C:\VM\TJ.vmdk’ or one of the snapshot disks it depends on. 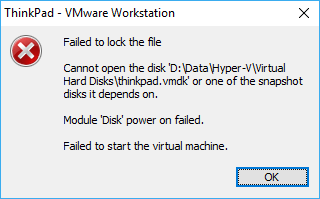 The error is most likely due to file locking on virtual machine. To prevent concurrent changes to critical virtual machine files and file systems, VMWare virtualization software establishes locks on these files. In certain circumstances, these locks may not be released when the virtual machine is powered off. The files cannot be accessed by the servers while locked, and the virtual machine is unable to power on. To resolve the error and start the virtual machine properly again in VMWare, locate the folder which stores the virtual machine, and delete all .lck files and directories and (optionally) .log files. After deleting the locks, the virtual machine will be able to boot properly.